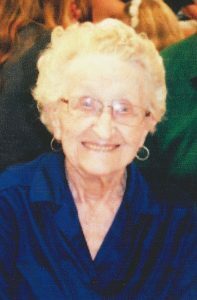 Age 95, of Lansing, MI, passed away at her home, January 28, 2019. Born in Lansing on November 12, 1923, to Emil and Olga Molzan. Erika graduated Lansing Central High School, class of 1942. January 19, 1942 she married Peter Denesuk. They were married for 65 years. 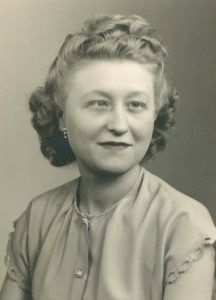 Following her sailor husband (8 years) she worked for the government during WWII in Virginia Beach and Corpus Christi. She was a school and political activist, P.T.A President and business woman. Well ahead of most. She was campaign manager for Polly Gibson who ran for the state house of rep. in the ‘60s. She was President and co-owner of the Lansing Cottonwood Campground. Known as the “Lady on the golf cart,” to many campers, she was called mom by many people. Erika was actively involved in the family business up until the last couple of years. She always felt that a woman should wear lipstick at all times. She enjoyed her grandchildren, great-grandchildren, reading, gardening and dancing. A loving mother, grandmother and great-grandmother (GG) and ferocious defender of family. Preceded in death by her mother and father, husband Peter, sister Irma Denesuk, brother Ervin Molzan and son Ronald Denesuk. She is survived by son Mark Denesuk, daughter Marcia (Dennis) Schmidt, brother Emil (Janet) Molzan, grandchildren Jacob (Nikki) Schmidt, Heather Schmidt and Damon Denesuk, great-grandchildren Kierra, Brooklyn, Riley, and Lily Schmidt, Leonidas Meissner, and many nieces and nephews. Funeral services will be held at 12:00 noon Wednesday, February 6, 2019, at the Estes-Leadley Holt/Delhi Chapel. Her family will receive friends 1 hour prior to the service. Burial will follow at Chapel Hill Memorial Gardens. Memorial contributions may be made to a charity of one’s choice. We are so sorry for your loss. Erika was such a special lady … and a little dynamo who made us feel like members of your beautiful family. We are so thankful for being able to share even a small part of her life. Our prayers are with all of you during this difficult time. She was a great lady and a special aunt. She is loved and will be missed very much. I am so sorry for your loss. Erika truly was a great woman. She will be deeply missed by all who knew her and was touched by her presence. So Sorry Erika was a sweet lady! Hugs to the families!